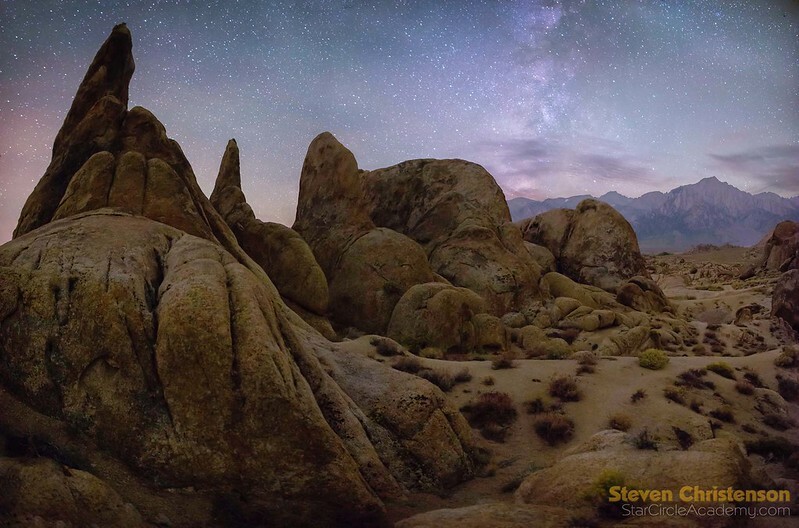 It is premature to say we are back in the saddle after a long hiatus, but Steven Christenson did recently join forces with his mentor: Harold Davis for another “Dark of the Moon” Shoot in the Eastern Sierras. We have plans in motion to do more workshops like this beginning in 2018 (planning date is early September). 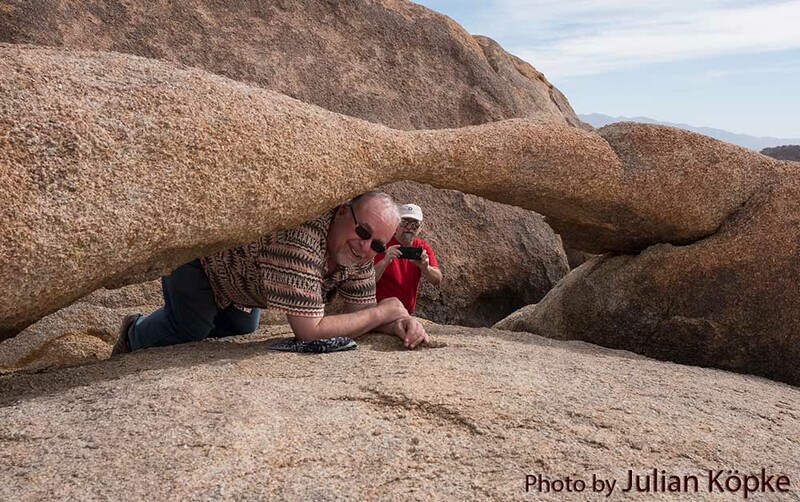 Harold and Steven at Lathe Arch. Photo by Julian Köpke. As is our custom, we arrive early and re-scout our planned locations during daylight – as well as checking other potential locations. Not every location is suitable for our participants. Some locations are too dangerous, or too difficult to reach due to vehicle clearance or hiking distances or too small to accommodate participants. One pretty place that fails some of those tests is Steven’s favorite spot he calls Pointy Land. Give Us A Tip, Will You? On the optional last night we went to a place that while large in area and easily accessible is not able to accommodate many photographers jockeying for the premium views. Such a place is the Lady Boot Arch below. It seems appropriate to leave you with a processing tip (thanks for asking). The shot below was created from two exposures. The filename we gave it is LaserBoot_C-5550+75.psd The name serves to identity both the photo AND the two images (C-5550 and C-5575) that we used to create it. Here is what the processing looked like from the “Layer Palette” of the image above. Using Photoshop Merge to HDR Pro. “Composite mode” balked that the photos could not be merged, while the “Automatic mode” produced an image like the one below. Photoshop could not figure out how to align the two nearly identical images. The laser and lit foreground confused it. So how did I get them to align? Selection, slight rotation and “nudging”. 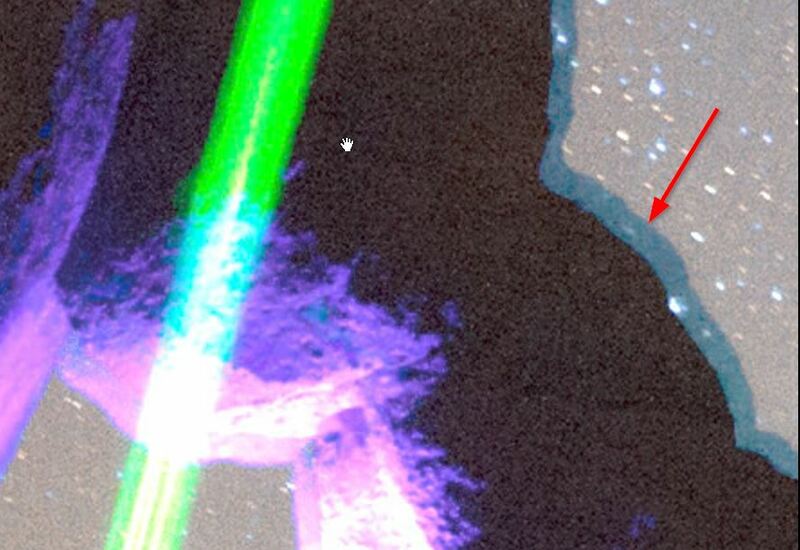 Since there was a lot of green bleed on the laser image (C-5575), I masked off that bleed – look at the layer mask on the bottom image in the “Photoshop Layers” image above. Deleted the sky. Delete? Yeah, just the delete key. That operation makes the selection go bye-bye and become transparent. The same effect can be done using the Eraser tool, but that is just too much work! Note: I should have first duplicated the layer in case I needed to do more work on it. Set the lighted foreground (C-5550) to Lighten mode. Removing a potentially conflicting sky from the image below results in an accurate sky that did not need much cleanup. We show one of the adjustments (Sky Color Correction). The actual curve(s) to use depend on the sky you start with. A careful observer will notice a lot of Curves Adjustment Layers. Curves can do almost everything all the other adjustments can do (lighten / darken / contrast / white balance and much more) so I recommend learning how to use Curves. Indeed we use curves so much that the Advanced Stacker Plus has a dedicated hot key: F9 to create a custom contrast enhancement adjustment layer. Once the masking and adjustments were all just as I wanted, the almost last step is to do Ctl-Alt-Shift-E (Cmd+Alt+Shift+E for Mac people). That finger twister is a little noticed but VERY handy shortcut that does the same thing as “Flatten image” – but it does the flatten to a new layer and leaves everything else alone. If for some reason the finger-twister does nothing, be sure to select a visible document layer – not an adjustment layer. After the magic twister sequence, drag the newly created layer to the top. I name the final layer: combined/heal. On that layer any distractions can be cleaned up using the spot healing brush. 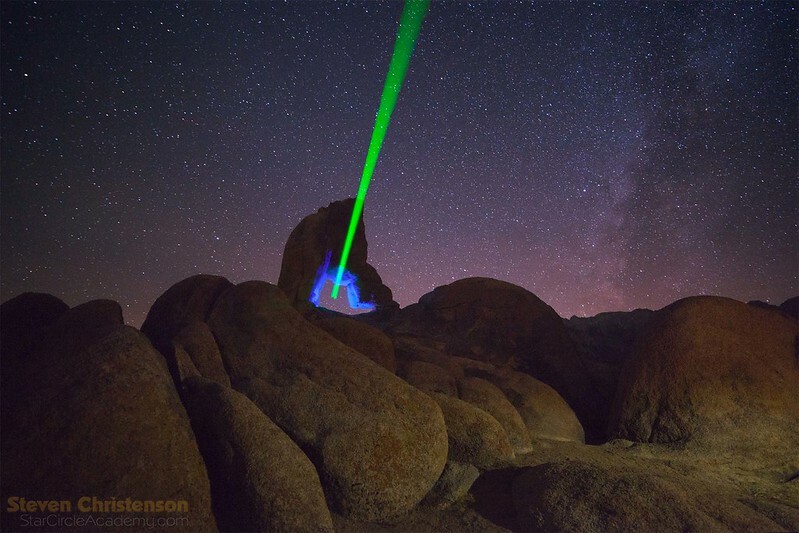 In Laser Boot photo there were a few hot pixels and some distracting marks on the rock that needed attention. If there is some significant noise reduction to do the heal layer can be cloned again and Noise reduction applied. We like this image created the second night of the workshop. This is a conventional star trail, but apparently Flickr-ites loved it. It became Steven’s most popular image ever. 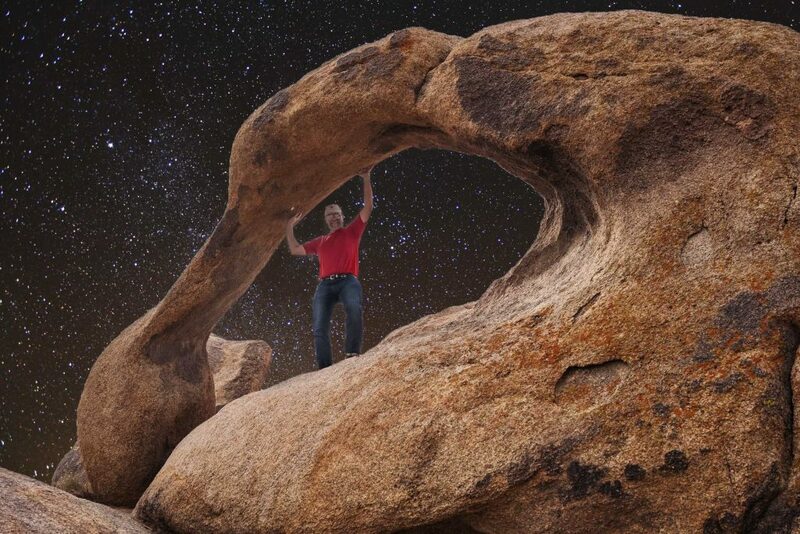 Steven in Galen’s Arch with composite Milky Way background. Foreground by Julian Köpke. Wait, looks like we have two more images for you. The image above is a complete cheat: a combination of an iPhone daylight shot by Julian Köpke, and one of the pieces of the Milky Way we shot for the image below. 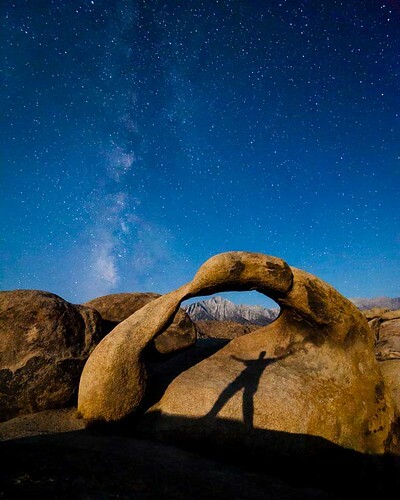 We make no guarantee that the sky can be oriented like that in the arch. We included the above shot because it used the same foreground/background blending technique we just discussed – but with a bit more manual mask painting. The image below is a Milky Way from horizon to horizon. North East is at the top, South West at the bottom. We included this image here because … we like it. One of the reasons we like this image is that the Milky Way is natural – not processed to death. We could have cloned out the camera, but thought it provided a nice context. This entry was posted in Announcement, Composites, Light Painting, Lightroom, Photo Tip, Photoshop, Star Trails, Workshop on October 30, 2017 by Steven Christenson. It is amazing how a planned six month sabbatical turned into 14 months. We decided to retreat from our teaching and photography schedule for the first six months of 2015. Family and work issues lengthened that to 11 months… and well, it has taken another several months to get back on our feet. And we are re-starting with a Free “Exploring Night Photography” class that extends from April 6th, to May 25th, 2016. However before I even started writing this column the class was full. The class would not help many of you since it is being taught in Los Gatos, California, with thanks to Venture Christian Church for providing the venue. But there is good news: in the coming weeks we will be publishing the material we use in the class HERE on the website. The class is aimed at DSLR photographers who have gotten out of “Automatic” mode at least once, but that is the only real requirement. You’ve got a Digital, Single Lens Reflex (DSLR) camera, and you are getting fairly good at it. Now it is time to try something new and creative: photos taken at night. Night photos can reveal the amazing majesty of the night sky (Isaiah 40:26). You will learn how to photograph in low-light using your DSLR. 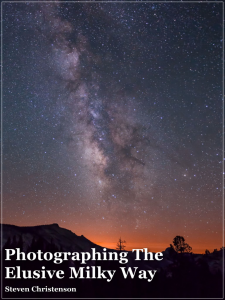 Along the way you will learn a little about the night sky and several photography techniques that will aid all of your photography efforts. Most of all you’ll be amazed at how much there is in the dark that remains unseen without the aid of a camera. You just might unleash a creative direction you may have never considered. This is a hands-on course. You will be taking photos on the very first session of the course, so bring all the equipment listed in the prerequisites. Must understand the basics of exposures – i.e. the relationship between f-stop (aperture), sensitivity and exposure length, and have shot photographs in some mode other than “Automatic”. 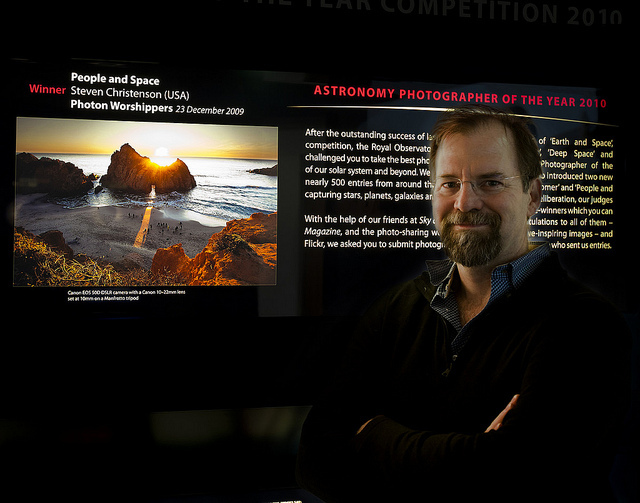 Steven Christenson is the founder and teacher of StarCircleAcademy.com, and winner of the 2010 Greenwich Observatory “Astronomy Photographer of the Year”, and a runner up in 2012. His work has been published as album covers, in the Economist and Backpacker Magazine and even featured on local TV stations. 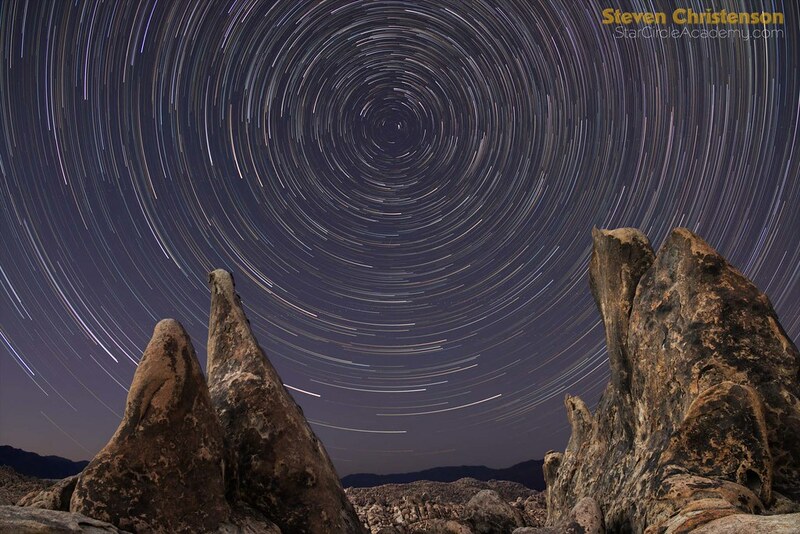 Steven specializes in “Landscape Astrophotography” a field that is easily approachable by anyone with a DSLR camera and a tripod. You can read his instructive columns on his website (StarCircleAcademy.com). What you will miss is the hands-on portion, of course, and the relentlessly punny style of Steven’s teaching, but the good news is that the discussion, resource list and class exercises will be right here for you to follow along. And, it is not too late to influence what we cover… So feel free to ask any beginnerish questions here and we will either respond directly or include that material in what we publish here on the web. Hope your skies are dark and clear, and the stars smile for you! This entry was posted in Announcement, Class and tagged Exploring, free, night photography on March 28, 2016 by Steven Christenson. 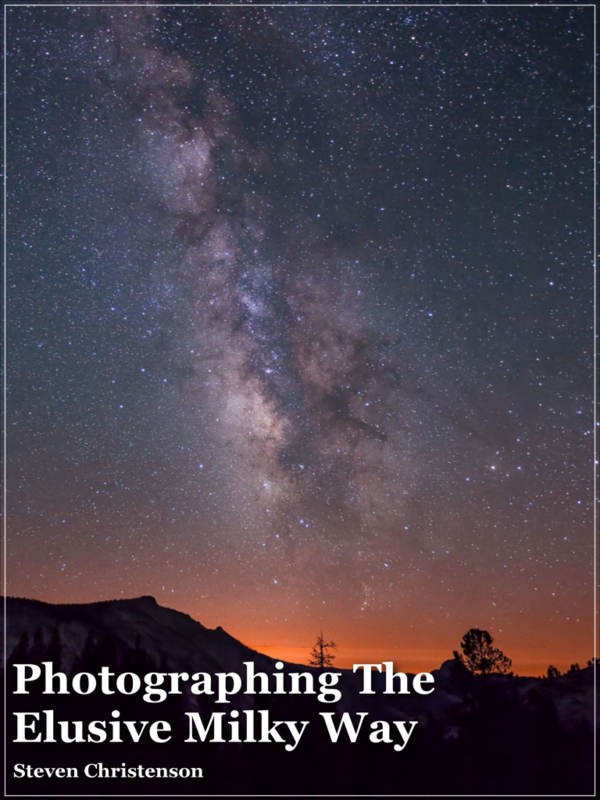 Last month, one of Steven’s images was featured in the great (and free) Extraordinary Vision magazine issue 9 which is published online via iTunes. 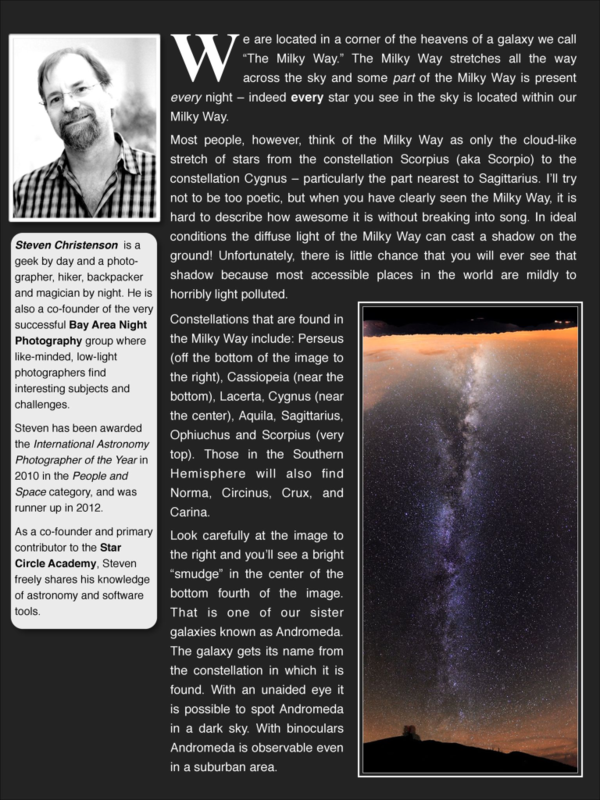 If you haven’t checked out the magazine, please do – not just because of the Milky Way content, but because Angelo Ioanides does a fantastic job curating and writing great content. And it’s FREE – just like the content on our BLOG. First page of the article. 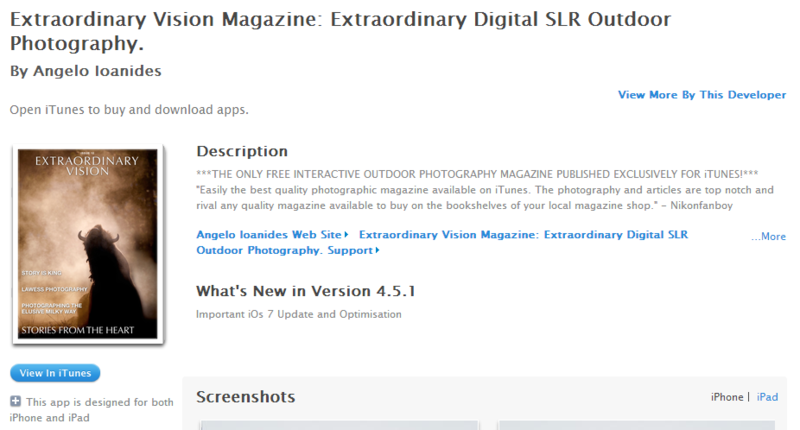 This entry was posted in Announcement, Camera, Color Correction, Creativity, Gear, Lightroom, Photo Processing, Photo Tip, Photoshop, Tools and tagged Angelo Ioanides, Extraordinary Vision, iTunes, publication on November 3, 2013 by Steven Christenson. As many of you know, we have been using Meetup.com to publicize, accept payments and sign ups for many of our events, including Webinars, Field Events, and Workshops. Unfortunately Meetup continues to make changes that make it difficult for us to maintain event documentation. The many extra steps we have to take to deliver information and content to you via Meetup has always been a pain. So, to make matters simpler for everyone Meetup is being demoted. We will continue to post summaries of our events on meetup but the primary method for signups and communication will be here on StarCircleAcademy.com where we will post complete details about our events. Our primary means of keeping in touch with you about our upcoming events is our Subscription page – rather than the difficult to manage Meetup tools for sending emails. We are excited to be able to handle webinar registrations here on our site because it allows us to do many things that are impossible to do with Meetup including immediately sending course materials, providing an option to buy the recorded webinar and/or special notes, allowing discounts for repeat attendance, and (once we’ve completed our last step) automatically registering for the webinar access code. On meetup everything needed to be a two and three step process. One other significant benefit is that each webinar will continue to live on the same page so not only you can see the complete list of webinars – whether currently scheduled or not, you can also bookmark the page of your favorite webinar(s). For us there is also a small assist because now we have a place to record when the last webinars were and what the comments were from past attendees. For example, check out what attendees have said about the Catching the Moon webinar. Just as with Webinars, having Field Events and Workshops on the site also allows us to immediately send the registrant private materials about the event including detailed meeting information, a list of Frequently asked Question, suggestions on what to bring, and so forth. In short, we’re doing a lot more here on site. But that doesn’t mean you shouldn’t like us on Facebook. We have many ongoing discussions on Facebook on various topics. This entry was posted in Announcement on October 11, 2013 by Steven Christenson.